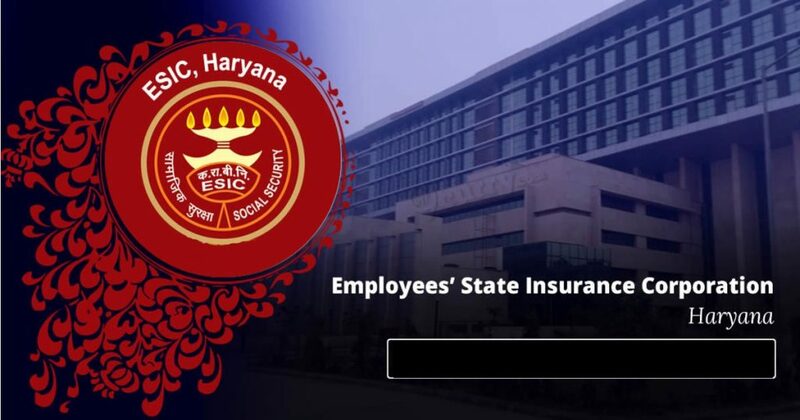 The latest notification is out: It is the notification of ESIC Haryana Recruitment 2019 issued by Employees’ State Insurance Corporation in Haryana for the posts of Stenographer & UDC (Upper Division Clerk). The post limits in total are 59. So, it is a grand opportunity for those interested, eligible and dynamic candidates who are willing to work in ESIC (Employees’ State Insurance Corporation), Haryana under Haryana Government. Mode of Selection Stenography Test/Interview & Computer Skill Test. Stenographer 11 1. Should have a Higher Secondary pass or 12th pass or its equivalent. 2. Typing speed should be of 80 words per minute in Hindi/English Stenography. 3. Must have the working knowledge of Computer with Office Suites & Databases. Upper Division Clerk 48 1. Any Degree of a recognized University/Institution or its equivalent. 2. Must have the working knowledge of computer including office Suites & Databases. The examination/application fee payment has to make through Debit card, Credit Card & Net Banking, IMPS Cash cards, Mobile Wallets etc. Candidates have to bear the bank charges. Payment has to make through the integrated payment getaway linked to the application form. For the Credit card users, all charges should be listed in Indian Rupees. If the candidate is a non-credit card user, he/she is required to exchange the local currency from the bank on the basis of the prevailing exchange rates. For more details, candidates need to check the pdf notification in the official website of ESIC, Haryana. The Stenography Test will be for 10 minutes, the speed of the typing should be 80 words per minute in Hindi/English & the transcription of the same within one hour. The VH (Visually Handicapped) candidates will get 85 minutes to transcribe the matter in English Shorthand & 95 minutes for Hindi Shorthand. For other necessary information related to Exam Pattern of Stenography, candidates have to visit the original website of the ESIC for the recently released ESIC Haryana Notification for the posts of Stenographer & UDC (Upper Division Clerk). For more information regarding the UDC (Upper Division Clerk) post, candidates have to visit the official website https://www.esic.nic.in/ notification of the ESIC, Haryana. Eligible and Interested candidates may fill the online application of ESIC (Employees’ State Insurance Corporation), Haryana from 16/03/2019 to 15/04/2019. For the convenience in filling the online application, candidates should follow these guidelines of online application filing of ESIC, Haryana. Step-1: For filling an online application, candidates should keep ready the valid scanned copies of photo, signature and email ID. Step-2: Then, candidates have to open or log on to the official website link of https://www.esic.nic.in/ recruitments. Step-3: Then, now on the home page have to click on the ‘Recruitments’ tab to select the willing post. Step-5: A new user has to click on the “Click here for New Registration” tab. Step-6: Then, after completing the registration, have to click on the ‘Submit’ button along with it have to click on the Registered Number and password. Step-7: After that, have to start filing all the details in the application and also to upload the photo & signature. Step-8: Then, have to make the payment of the online application fee at the end of submitting the application form. Step-9: Finally, have to take the printout of the Online Application for future use.